The second hammock I ever purchased was the Grand Trunk Ultralight. But that was years ago, before Grand Trunk had changed their name and they were the Travel Hammock company. They’ve come a long way since then and their gear has really matured, but they’ve still stayed true to their roots. Grand Trunk innovated early on with their jungle hammock, the Skeeter Beeter, and pushed the envelope with the first ultralight hammock, the Nano. When they shifted production out of Bali they introduced the first patterned fabrics and print designs that are still unmatched in the industry. The OneMade gear is a new collection of hammocks and straps that are made in the USA. It rounds out Grand Trunk’s suite of hammocks and widens the gap between the other big brand hammock companies in terms of fabric patterns, quality construction, and hometown support. The OneMade hammocks are large, measuring 10.5 × 6.5 ft (3.2 × 2 m) they are some of the biggest hammocks available. They feature a common three panel design but are constructed with a flat felled seam that is flatter and smoother than other brands. The edges are hemmed with ribbon, which adds a professional touch and adds some nice color contrast. The construction is clean and the stitching is straight and even. I found only a few loose strands. The ends are gatheed using a closed sewn webbing loop, similar to what Therm-a-Rest introduced in their Slacker hammock. It’s a superior design choice than the typical rope cinch method because it allows the fabric to slide and adjust, relaxing the edges for a better lay. Gone are the cheap steel carabiner clips and in their place are high-quality wiregate carabiners. The lay is fantastic. The longer dimensions means I can open up the hammock with a deeper hang angle and lay diagonally without issues. 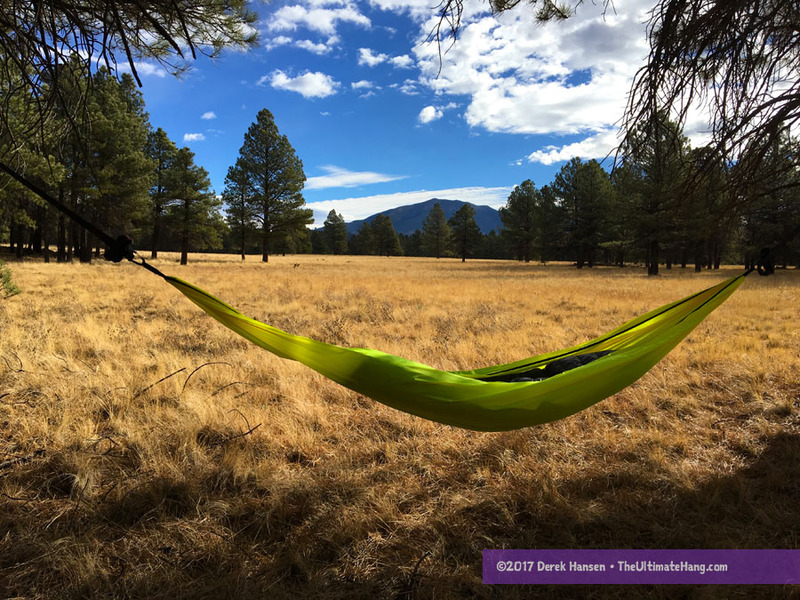 I reviewed the bright yellow hammock and the fabric has a soft hand and is light and packs down surprisingly small, unlike parachute nylon hammocks with smaller dimensions. The stuff sack appears too small but it’s actually large enough to easily pack the fabric without difficult with plenty of room for the carabiners to fit. In fact, the entire hammock packs so small it makes a great travel companion. I will say that the hammock lives up to its slogan: Stronger. Lighter. More compact. The OneMade 14er straps have a daisy chain design and evoke a Rocky Mountain sentiment. What makes these straps stand out is the unique material combination and the light weight for a 14-foot length! Most daisy chain straps are only 10 ft (3 m) long and weight northward of 16 oz (0.5 kg). These straps get you an additional 8 ft (2.4 m) of suspension for less weight and a higher capacity! The straps use 840D nylon base with a polyester lock to prevent stretching. This provides lighter weight and strength of nylon but also the UV protection, hydrophobic and low stretch properties of polyester. The T70 seatbelt stitching on the loops gives these straps a high 400 lbs working load limit. Daisy chain straps are probably the easiest strap styles to use and combine tree protection for the anchor point and an adjustable suspension system. The only downside is the price. These straps are almost twice the price of generic daisy chain straps. However, you’re nearly getting a third strap, plus the lower weight and higher weight rating. For anyone used to hanging on large trees like me (Ponderosa Pine), having longer straps is ideal to get around the diameter and provide enough suspension length. Some folks may worry about the nylon material, but in my testing, the straps didn’t have any noticeable stretch. I think the polyester blend is doing its job. TIP: I recommend wrapping up any loose strap and tucking it into one of the open loops. This helps keep the straps tidy and untangled. For a lot of folks, finding outdoor gear made in the USA is an aspiration that’s hard to realize. Most commercial gear is made overseas and often the quality is hard to manage. The OneMade line doesn’t just take Grand Trunk’s standard product line and make it in the USA. They’ve improved on the design and added quality at every turn. The material has a higher quality feel, the stitching is precise, and the trimmings are well thought out. The OneMade line is a fantastic choice. The hammock is large and comfortable and the straps are light and strong. Suspension and Anchor System ♥ ♥ ♥ ♥ ♥ -1 for not bundling any suspension with the hammock, but the OneMade 14er straps are a great companion to the hammock. The open webbing loops on the gathered ends is a great design choice. Aesthetics ♥ ♥ ♥ ♥ ♥ Lots of color options available. Fabric has a nice hand. Price and Value ♥ ♥ ♥ ♥ ♥ The USA-made commands a premium price in today’s market, but the quality is matched by the lighter weight, higher strength, and smaller pack size. It’s an investment that will pay off. Do you have a review of the GT Skeeter Beeter? I searched but couldn’t find one. How strange. I’ve certainly used one but I can’t find a review either. It’s very similar to the Byer of Maine kakoon hammock reviewed on this site.